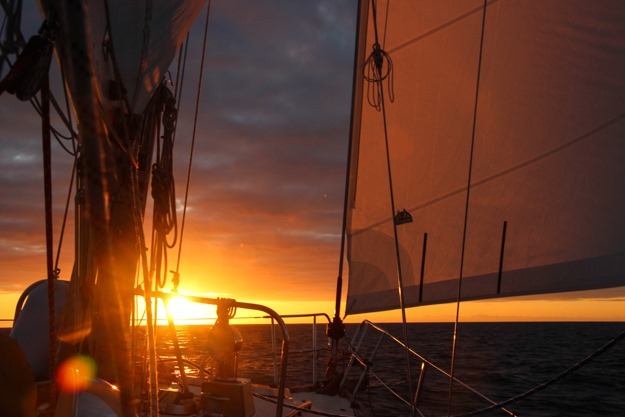 In July, month four of our cruising plan, we started slowing down (intentionally) and enjoying hot weather and easy sailing. After the challenges of June, easy sailing in Johnstone, Desolation Sound and the Strait of Georgia was a welcome change. 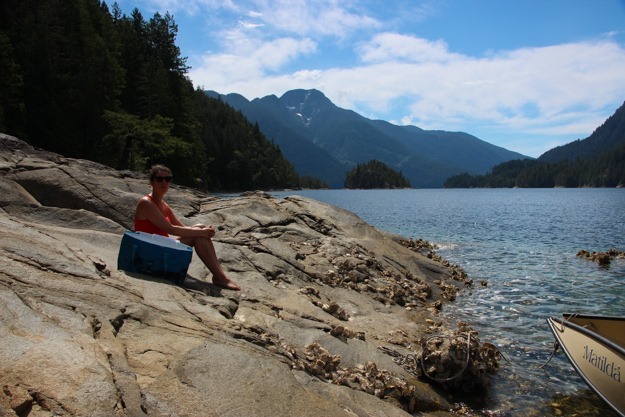 Also it got hot – really hot, in some cases – 90F in Desolation Sound. We weren’t used to this heat, and it was great while sailing (like sailing in the tropics!) but tough the rest of the time (sailboats heat up like an oven, and good ventilation doesn’t really do much when there’s no wind). 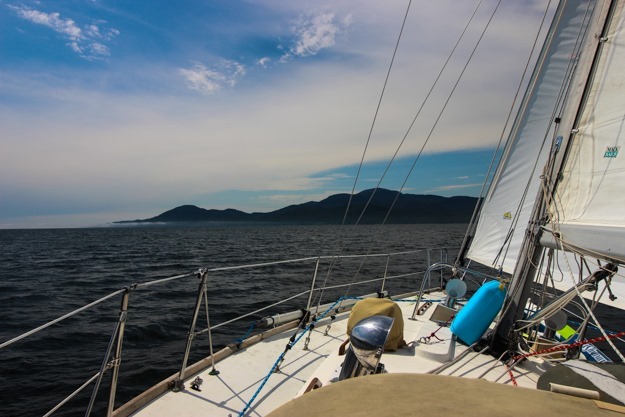 In July we went from Port McNeil to the Gulf Islands (Tent Island, at the top of Saltspring). We only did 20 days of sailing (we had a 5 day break to attend a wedding, and 5-6 days where we stayed in the same anchorage), and took a fairly meandering route (see map below). Blue line indicates approximate rhumb line, not actual sailed line. We had a fast downwind sail through Johnstone Strait, and then took a loop around East Thurlo Island. 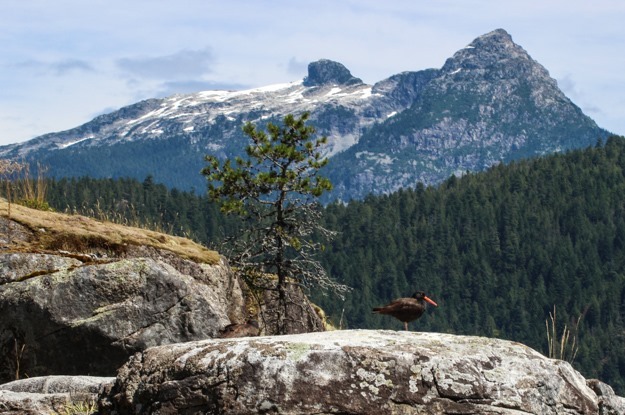 We reprovisioned in Campbell River and then sailed to Desolation Sound, spending 5 days in Pendrell Sound enjoying the sun, swimming, inner-tubing, paddleboarding and hiking. 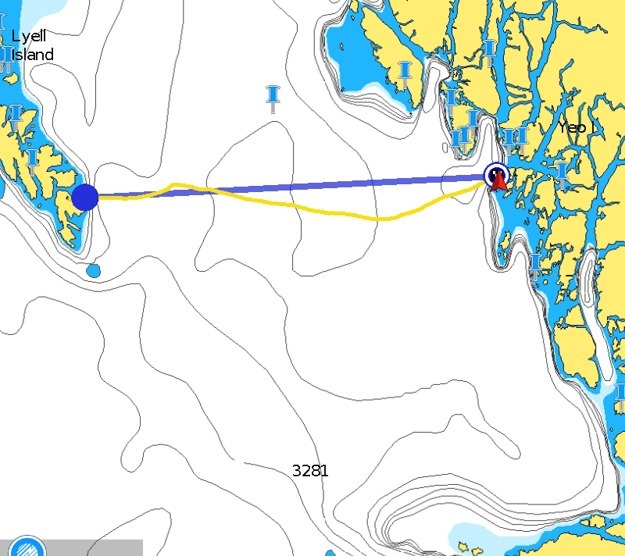 Next we sailed to Cortes Bay and then headed south in the Strait of Georgia, having very light NW winds (2-6 kts). At Tribune Bay, the wind pattern picked up to NW 15-20 but only at night – from about 8pm – 8am. Very strange, and inconvenient since it meant windy nights at anchor and windless days with very slow sailing. We spent 2 nights at Jedediah Island and some forest fire smoke moved in, making for bright red sunsets but lower visibility. Next we headed to Nanaimo and spent 2 nights at anchor catching up on chores, reprovisioning, and hiking around Newcastle Island. Nanaimo was busy! About 100 boats in the anchorage and frequent ferries and dinghies racing about, making for choppy conditions until dusk. The wind pattern switched to moderately strong southeasterlies as we headed south to the Gulf Islands through Dodd Narrows. The Gulfs were unlike I’ve ever seen them – SE 15-20 and pretty choppy waves (wind against current), enough to send saltwater back to our dodger. Previously we’ve only had NW wind in the Gulfs in the summer, and 20 knots was a surprise – usually it’s light wind days (5-10) with the spinnaker up. 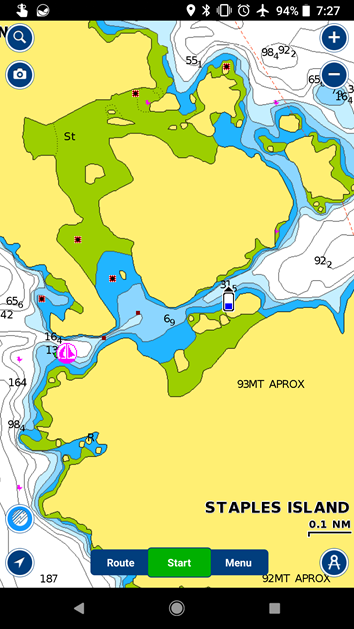 Highest wind speed at anchor: 15-17 knots (SE) at Montague Harbor, north of the beach; and 15 knots NW at Tribune Bay, Hornsby Island (a motorboat dragged here in the night, to port of us). This entry was posted in cruises, summary on August 4, 2018 by Patrick. We’ve wanted to anchor in the Walker Group for a while now but had always passed it up. It’s in the middle of Queen Charlotte Strait and is a small anchorage, only fitting perhaps 3-4 boats. Since it’s in the middle of the strait, it can be somewhat tricky to get into if there’s 20+ knots of wind blowing against current. The first time we tried to go there, on our way north this year, we had NW 20 gusting 25 against 1-2 knots of ebb current, and we pounded upwind in the sloppy mess that created (3 foot close spaced waves) for 2 hours, only to find that the anchorage looked pretty full, plus a bit of a scary entrance. Swell was rolling right up to the narrow west entrance, which is about 80 ft across and exposed to NW winds. There are two entrances (east and west), both narrow, and the east one is choked with kelp at low to mid tide. This time we had lighter wind and were near high tide, so we entered through the east entrance since we were coming from Miles Inlet. 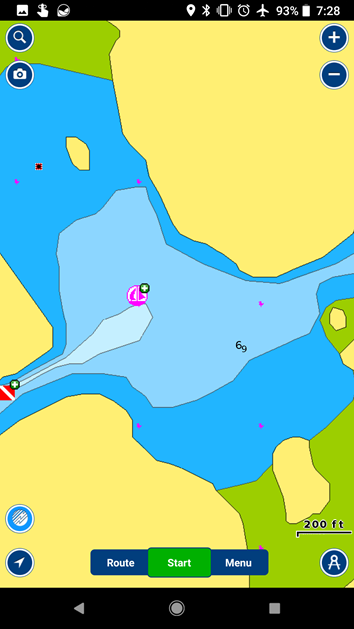 We threaded a course mid channel to avoid the kelp, and the next day exited through the west entrance (this is the easier way, as it’s passable at all tide levels). Luckily there was no one there, so we had the anchorage to ourselves. This made anchoring simpler, since there’s not a lot of room and NW wind was blowing through the anchorage at about 15 knots. The NW gusts seem to actually amplify in the Walker Group – we had only about NW 10 in Queen Charlotte Strait. View out the west entrance of The Walker Group. This entry was posted in cruises on July 28, 2018 by Patrick. As we sailed through Race Passage in Johnstone doing 6 knots over water and 8-10 knots over ground, with pretty much flat water, we marveled at the conditions. Easy downwind sailing in Johnstone on a sunny, warm day – it can’t be often that this happens, and we felt really lucky. 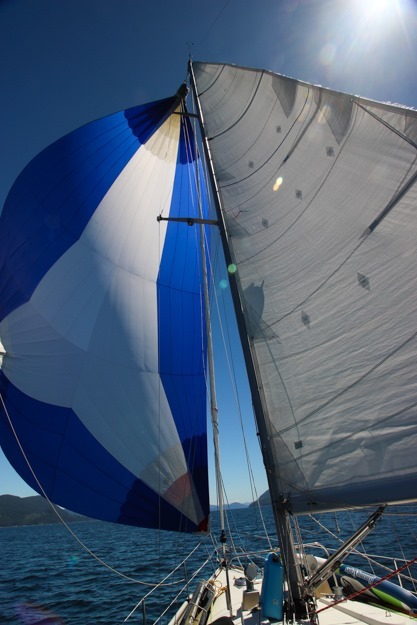 We went through all our favorite downwind sail configurations: spinnaker and main wing-on-wing, genoa and main wing-on-wing, and broad reaching with a slightly reefed main and reefed genoa. Our boat loves 15-20 knots of wind downwind, and we had that pretty much the whole duration of the flood tide. A sweet downwind sail in Johnstone while southbound is more probable than not, but it’s not a foregone conclusion. The last time we did it, we had to motor one or two days in very calm, windless conditions. Other times, Johnstone is raging gale force winds that even downwind wouldn’t be very fun. So we were very excited when this year our southbound run through Johnstone worked out pretty much perfectly – NW 20-30 the first day, and NW 10-20 the second day. We started from Farewell Harbor in Blackfish Sound, hopped to Port Harvey, and then to Blind Channel anchorage (not truly the end of Johnstone, but close, and we had extra days we wanted to spend exploring the area around East Thurlow Island). This entry was posted in cruises on July 19, 2018 by Patrick. Month three of cruising was our most challenging month yet, stretching our capabilities as sailors and testing our patience with wind and weather conditions. June is early season in Haida Gwaii, and we had some of our toughest sailing there, but really enjoyed late June conditions on the Central Coast. In April (month one), we traveled from Seattle to the Octopus Islands near Campbell River, BC. 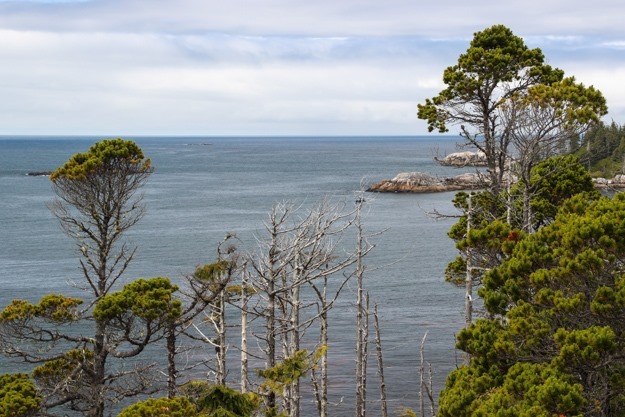 In May (month two), we sailed from the Octopus Islands to Haida Gwaii. In June (month three), we went from Queen Charlotte City at the center of Haida Gwaii to Port McNeill. June started in Queen Charlotte City, where we reprovisioned, rented a car for 2 days and explored the north end of Haida Gwaii. We then moved to Sandspit marina at the east end of Skidegate Inlet, where we got stuck for 5 days waiting out southeast gales. On the 3rd day we tried leaving, overly optimistic about the forecast, got beat up in huge waves and wind across the Sandspit bar and turned back. 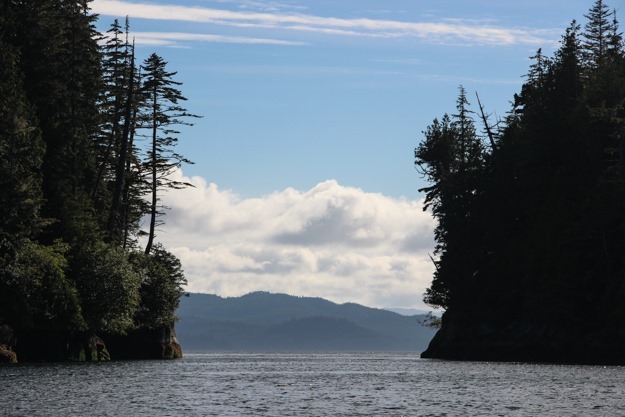 On June 9 we had a good forecast, escaped Skidegate Inlet and were back to normal cruising! We made our way through Gwaii Haanas national park, briefly waiting out another 2 day gale in Bag Harbor. When the wind finally turned north, it did so suddenly and with a bit more force than we would’ve liked. We had a harrowing crossing of Hecate Strait on June 15 in 30-35 knots with 6-12 foot waves at 6-7 second interval. But after that it was back to the Central Coast, which we love and provided some nice easy sailing days plus 4 days at the beaches of Pruth Bay. We had fun spotting all the R2AK (Race to Alaska) boats and rounded Cape Caution under sail this time. We explored the wildlife rich anchorage of the Walker Group and then finished the month in Port McNeill for a couple days. This entry was posted in cruises, summary on July 4, 2018 by Patrick. After our harrowing passage across Hecate Strait in a gale, we were ready for some easy sailing days. We landed in St John Harbor of Milbanke Sound, and spent a rest day cleaning up the boat of salt and everything that got tossed around. We then sailed to Shearwater, having a fantastic downwind sail in sun and 15-20 knots of wind. It was just what we needed after the awful Hecate passage in terrifying waves. 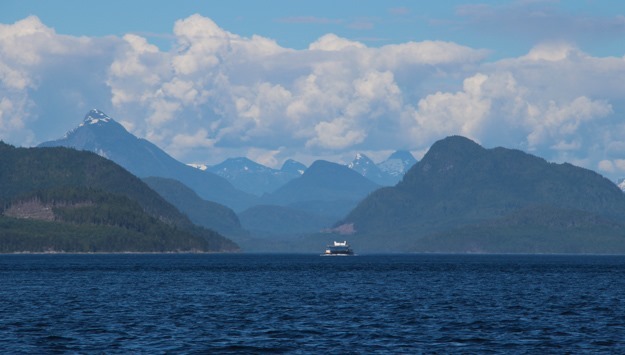 We anchored by Shearwater and were shocked at how hot it is here – apparently summer is on the Central Coast of BC! The fleeces and cold-weather gear we wore in Haida Gwaii were replaced with shorts and t-shirts. This entry was posted in cruises on July 3, 2018 by Patrick.